Brown & Haley - Confectioners since 1912. From Brown and Haley comes the famous Almond Roca. Delicious, delightfully scrumptious, Yum! Each Chocolate Almond Buttercrunch Roca is elegantly wrapped. Brown and Haley's Master Confectioners use only the finest quality ingredients to create this all natural Almond Roca Buttercrunch. They use premium California Almonds, pure vanilla, local butter and their own signature blend of cocoa beans. Each Bite of Almond Roca is an irresistible taste of buttery goodness. 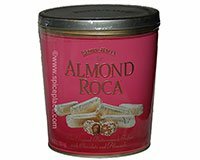 Enjoy Almond Roca Buttercrunch -- the special treat that will delight you and those you care about. All Natural. No Artificial Flavoring, Colors, or Preservatives. Approximately 58 pieces per tin of Brown & Haley Almond Roca. Product of USA. Tin Made In China. Ingredients: Sugar, Almonds, Butter (Cream, Salt), Palm Oil, Palm Kernel Oil, Cocoa Processed with Alkali, Skim Milk Powder,; Whey (Milk), Non-fat Dry Milk Powder, Soy Lecithin As An Emulsifier, Unsweetened Chocolate (Cocoa Mass), and Vanilla (natural flavor). Allergy Information: Contains Tree Nuts, Milk and Soy.